In the seventeenth century, English tourists visiting the Dutch Republic complained that the country stank like tobacco. Historically, they were accurate. In the 1620s and 1630s Dutch students at the University of Leiden were the fi rst generation of young people in Europe to take up smoking tobacco, and turn it into a mainstream recreational habit. Before then, sailors and soldiers, who were considered social degenerates, were the only ones that smoked. In the 1620s the University of Leiden started experimenting with tobacco in hope nicotine would be a cure for smallpox. However, students fi gured out tobacco did not cure (or prevent) smallpox but it sure did give a nicotine- high. Within a couple of decades smoking tobacco became the Dutch national pastime, and the rest, as they say, is history. Well, not so fast. In the very country where smoking became a dirty habit might also become the fi rst country in the world to banish smoking from the public domain. In the Netherlands, the city of Groningen is taking the lead with nine institutions including the University of Groningen, the University Medical Center Groningen (UMCG), and Verslavingszorg Noord- Nederland (Addiction Care North Netherlands) to back a far-reaching initiative to banish smoking from several public areas in the city. The movement to banish smoking from public areas is initiated by Rookvrij Generatie (Smoke-Free Generation), an organization that aims to ensure that all children born in 2017 are not exposed to cigarette smoke either from smoking themselves or second-hand smoke. According to Rookvrij Generatie, each year in the Netherlands 20,000 people die from cigarette smoke. Due to the addictive qualities of nicotine, once a young person starts smoking (usually in high school), they are likely to become life-long addicts. According to a study conducted by the CBS – the Dutch Bureau of Statistics- 23% of Dutch population smoke cigarettes. The breakdown of the age groups is even more alarming: 24.4% of the 16 to 20 year-olds use tobacco, and 38.1% of the 20-30 year olds smoke daily. However, the good news is the older age groups smoke considerably less. 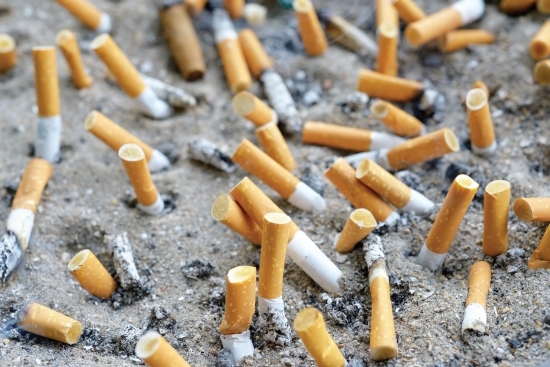 That is the reason Rookvrij Generatie aims to banish smoking from public areas such as playgrounds, schoolyards, and the vicinities around university buildings, hospitals, and municipal buildings. Robert van de Graaf, who is the spokesperson for Rookvrije Generatie in Groningen and physician specialized in curing addictions, believes the less young people are exposed to cigarette smoke and observing adults smoking, the more smoking will be seen for what it really is, an addiction. Contrary to other addictions such as heroine, smoking is socially accepted, and tolerated. Today society thinks it is perfectly normal for adults to smoke at playgrounds, schoolyards, and even at the entrance of hospitals where patients are allowed to smoke, sometimes still hooked up to an IVstand. De Graaf believes society is sending the wrong message to children with these inconsistences. The extent of the smoking ban in public places has not yet been determined, however, many residents of Groningen are responding positively to the idea. Whatever happens in Groningen will be a precedent for the rest of the country, and the world. Amsterdam has already shown an interest and will probably follow Groningen’s lead. It would be ironic that the youngsters of the seventeenth century were the fi rst generation in history to smoke and the generation born in 2017 will be fi rst generation of non-smokers. Time will tell.